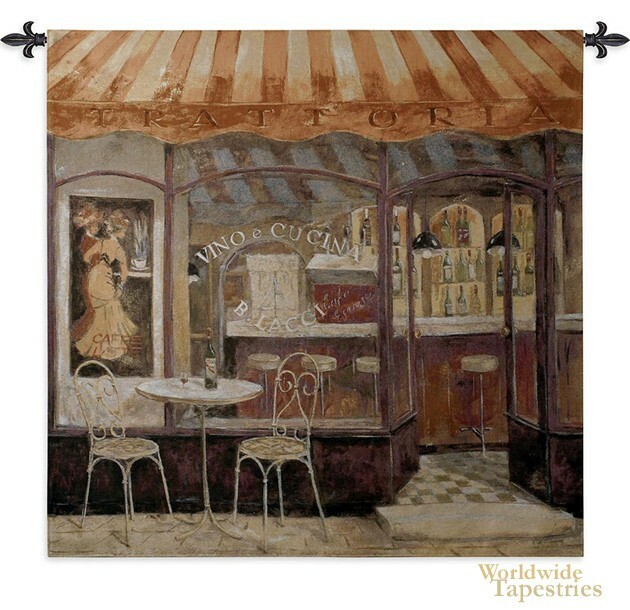 Italian Cafe tapestry shows a delightful scene of a wine cafe in the streets of Italy. Full of charm, this work celebrates the lively culture of Italian restaurants as we see a cafe offering wine and food. The color palette is warm and rich and offers burnt orange, beige, browns and earth red in a scene which is alive with the vibrancy of the colorful life on Italian cafe strips. This Italian Cafe tapestry is backed with lining and tunnel for easy hanging. Note: tapestry rod and tassels, where pictured, are purchased separately.